Janet B. asks: How does soap kill bacteria? For well over a century, public health officials have been pushing regular hand washing with soap as one of the most effective methods of inhibiting the spread of disease and infection. The result of physical, as opposed to biological processes, proper hand washing with regular soap will thoroughly remove bacteria. 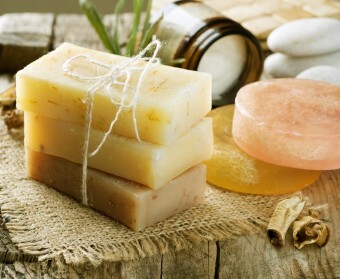 Yes, contrary to popular belief, soap just helps remove microbes, it doesn’t kill them. Throughout the day, your hands pick up bacteria and viruses from a (surprisingly) wide variety of objects. Keyboards, especially at public stations, are widely acknowledged to be filthier than toilets square inch for square inch, as are most smartphones and tablets. That’s not to mention door handles, cash and credit cards, or the common practice of shaking hands when greeting someone you don’t see often or have never previously met. Even the paper towels in public restrooms that you dry your hands with after washing are commonly riddled with microbes spread about from people flushing and the like. Yes, microbes are quite literally everywhere, though thankfully most are harmless to humans, and some are even essential for our lives, as well as certain types of tasty foods (see: Humans and Our Love of Spoiled Foods). So how does the soap actually work to remove the offending microbes if it doesn’t kill them? When you wash your hands with regular (as opposed to antibacterial) soap and water, the soap chemically works to break down the oil, while the friction from rubbing does it mechanically. Thus, the more soap and the longer the hands are rubbed together, once rinsed away with water, the less oil and microbes left on your hands. Public health officials generally agree that this method of hand washing, for at least 20 or more seconds at a time, is a highly effective way of removing bacteria despite the fact that the bacteria doesn’t die, but is simply flushed away when you rinse (or wiped off on a towel). Of course, even regular soap will be ineffective if it’s contaminated, which is what often happens with refillable dispensers; in a recent study conducted in an elementary school, it was discovered that more bacteria was found on the hands of staff and students after they washed with soap from contaminated dispensers than before they ever touched them. Each year in the United States, 2 million people become ill with drug resistant bacteria or fungus, and 23,000 of those die. According to the CDC, the most urgent of these threats are the Clostridium difficile, Carbapenem-resistent Enterobacteriaceae (CRE) and drug-resistant Neisseria gonorrhoeae. In addition, there are a number of other resistant germs that are posing serious threats and these include multidrug resistant Acinetobacter, drug-resistant Campylobcter, Fluconazole-resistant Candida, Vancomycin-resistant Enterococcus (VRE), multidrug-resistant Pseudomonas aeruginosa, two different types of drug-resistant Salmonella (non-typhoidal and Typhi), Methicillin-resistant Staphylococcus aureus (MRSA), drug-resistant tuberculosis and drug-resistant Streptococcus pneumonia. In addition to unnecessary prescriptions, another cause of drug resistant germs is the common practice of feeding antibiotics to livestock (both as a preemptive attempt to ward off infection and for their ability to enhance growth). In a 2012 study, researchers demonstrated conclusively how Staphylococcus aureus first went from humans into pigs, then developed resistance to both methicillin and tetracycline, and has now returned to prey on the human population as methicillin-resistant Staphylococcus aureus. Called “pig MRSA,” it is found in nearly 50% pork now available in the U.S., and if the meat is improperly handled, the germ can spread to people. It has been a decade since the medicos have warned of imminent antibiotic collapse,yet the world is going own.23000 per annum is a huge figure but inherent constitution of an individual is an important factor. I can confirm anecdotally, based on the roughly 5 hospital antibiograms I’ve examined in the past year, that antibiotic resistance continues to worsen and it seems to be accelerating despite our best efforts. Luckily, most hospitals have not hit the point at which ALL antibiotics are useless against a single organism, but they are increasingly utilizing less commonly used classes such as Polymyxin. Just because we haven’t hit an overall “antibiotic collapse” doesn’t mean we aren’t firmly headed in that direction. I just want to state that this article kind of skips over the very basics of how soap works. Please cite your source for the phrase “soap just helps remove microbes, it doesn’t kill them.” Thank you. @Mike McGuire: Sources in the references section. There aren’t any ingredients in regular soap that would do any harm to microscopic organisms. The ingredients only serve to over come hydrophobic and hydrophobic interactions that prevent water from getting things like oil, dirt, and grime off of your hands. It just makes water an effective vehicle to transport all of that stuff from your skin down your sink.